Pearl was alone, abandoned by her husband to care for their two children. With little money and no protection, Pearl and her children were at great risk of those who target the desperate and vulnerable in the notorious trafficking market of Thailand. Despite the dangers of Pearl’s environment, she ventured to open a pearl shop. 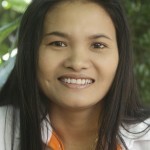 Longing to see Pearl, her family, and her business flourish, WAR, Int’l proudly began a partnership with her. She now interacts with WAR, Int’l staff and jewelry experts regularly, seeking mentorship and resources to grow her business and provide for her family. Now, not only does her shop supply a reliable income, but it also creates jobs for many other women. As Pearl’s business continues to grow, so does the circle of protection around at-risk women in the community. Know that when you purchase these beautiful pearls, you are wearing the story of a woman protected and empowered, working to empower others to live with dignity.